There are two types of people in this world: people who give their cars a name and people who think that’s really, really dumb. But hey, it’s human nature to anthropomorphize (SAT word!) inanimate objects, so I’d wager there are more of the former. My cars’ names have always been descriptive: Blue, Green, The Mini, The Limited, The Cobra, The Jetta, etc. A quick poll around the office turned up names like Bluebonnet, Maggie, Element (for a Honda Element), Suby (for a Subaru), Vanessa aka the Green Meanie, and Muffin. Clearly, I need new coworkers. Anyway, a study commissioned by AutoNation confirms that the more cars you own in your life, the more likely you are to participate in the name game. 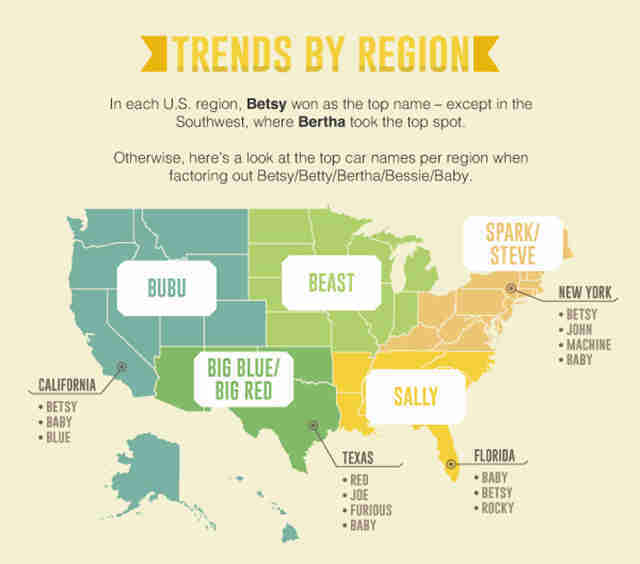 The most common names are Betsy, Betty, Bertha, Bessie, and Baby, though why everyone is so obsessed with the letter B is anyone’s guess. Not only do guys name their cars, but guys unashamedly name their cars The Beast. At first blush, it conjures up images of monster trucks and the kinds of vehicles most frequently found in low-lying, muddy areas. But it’s also the name of the presidential limo. So let's make a distinction here: if your ride has smoke stacks, you're impressing absolutely no one if you name it The Beast; if, on the other hand, it comes with its own Secret Service detachment, go riiiiight ahead, sir. 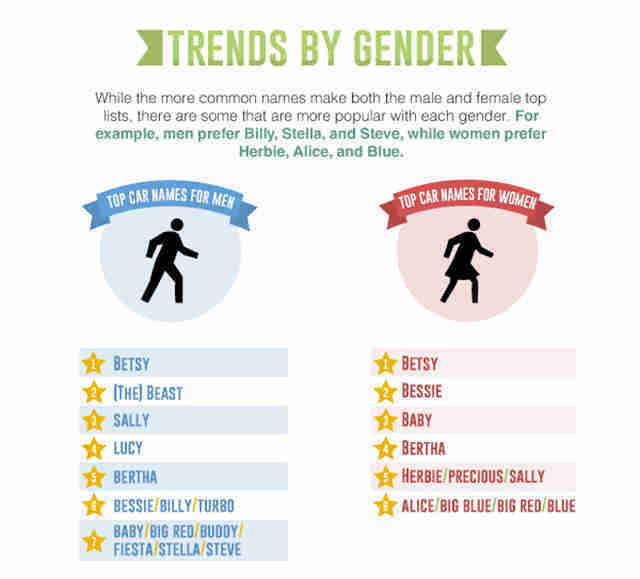 As for the top names for women, there's Baby. There's Alice. And there's the very creepy Gollum/Smeagol homage, Precious. 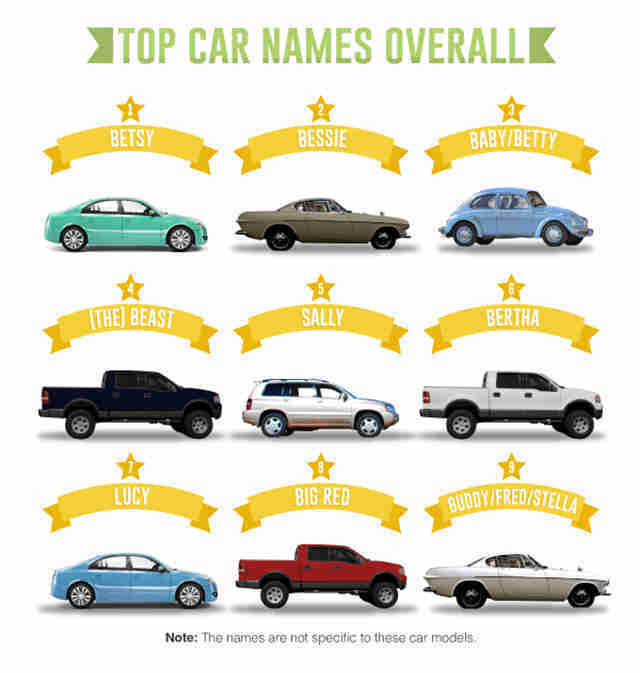 Across the country, the most-named car model is the Ford Mustang. Considering songs like "Mustang Sally" existed back when the car was in its infancy, that doesn't come as a surprise. What is weird, however, is the Fiesta showing up at No. 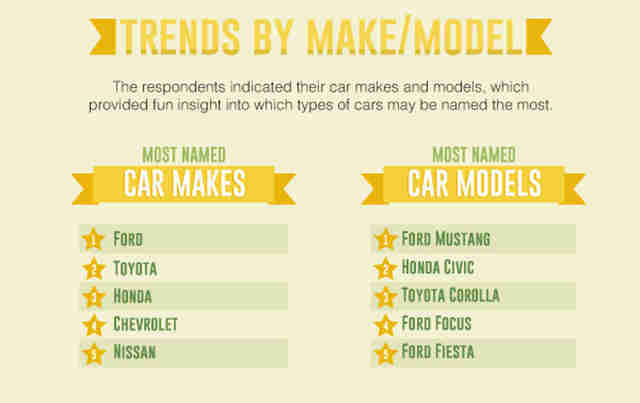 5, since Fiesta happens to be tied for the seventh most popular car name among men. Right up there with Steve. So if you've got a Fiesta named Fiesta or a Fiesta named Steve, congratulations on being incredibly unoriginal. OK, the Southeast clearly has its movie geography all wrong. Rocky? C’mon. That’s Philly’s territory, Florida. 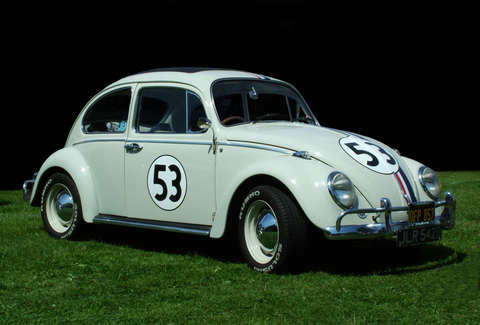 Sally comes from Pixar's gem, Cars... which took place along Route 66 in the Southwest. Besides, Sally’s based on a real person who runs a Rte. 66 diner in Oklahoma, complete with a grill named Betsy. I’ve dined there. It’s good. Texas, a very big red state, has a lot of cars named Big Red. Naturally. But I’m honestly not sure which is a weirder name in New England between Spark and Steve. One sounds like a hyperactive Jack Russell puppy, and the other is... Steve. I just can’t get past this overall list, though. Big Red, I get. It’s big, it's red, and it's a whole lot of fun. You’ll probably drive it till it falls apart, and Big Red just goes on and on, while you do it… Wait, that’s the gum. Anyway, Fred is the ninth most common name. I can totally get behind naming your car Fred after it gives up the proverbial ghost. If the only way you can get you car started is by using your feet, Flintstones-style, you’re good here. I'd actually award bonus points if you name a vintage Ferrari Dino Fred. But you wouldn’t. You’d probably be too busy naming it Lucy or Lola or Buddy or Steve. Aaron Miller is the Cars editor for Thrillist, and can be found on Twitter. His full list of cars' names: Blue, Green, The 96, The Limited, The Cobra, The Jetta, The Jag, Blau, The Mini, The 2. He has absolutely no clue what that says about him.